Why are Duggar parents speaking out on scandal now? The story of improper touching by reality TV star Josh Duggar is also a story about the improper release of juvenile records, Josh's parents Michelle and Jim Bob said in an interview aired by Fox News on Wednesday. The Duggars' anger over the release of the records helps to explain why they decided to grant an interview at all. The family stars in the TLC series "19 Kids and Counting," which remains in limbo while Josh Duggar's past acts of molestation remain national news. But the family seems to be going on the offensive after two weeks of what the parents called an "unprecedented attack" against them. Two of the older sisters, Jill and Jessa, also spoke with Fox's Megyn Kelly on Wednesday. Only a brief portion of that conversation was shown on Wednesday night as a "tease" to Friday's edition of Kelly's show. In the video clip, the sisters focused on the new violation of privacy, not the old violations by their brother. Jill tearfully said, "They can't do this to us. We're victims." By "they," she meant the officials who released the juvenile records. Jessa also said, "The system that was set up to protect kids, both those who make stupid mistakes or have problems like this in their life and the ones that are affected by those choices. It's greatly failed." "There's an agenda" behind the negative attention, said Michelle, who also indicated that some of the scrutiny seems motivated by disrespect for the family's conservative Christian values. 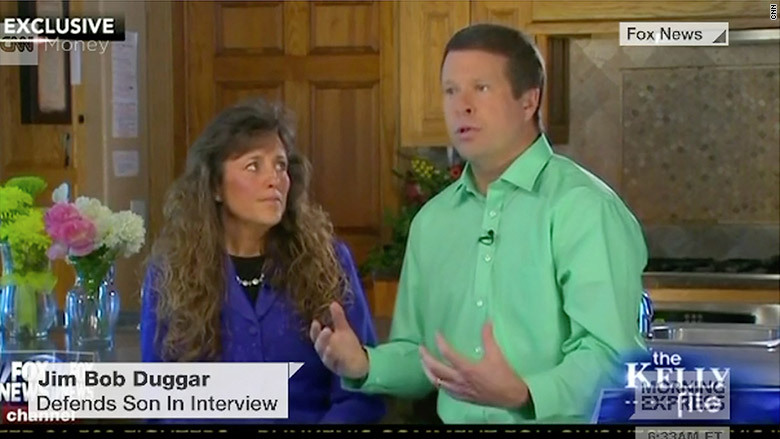 The Duggars "cast themselves as martyrs" in the interview, Washington Post TV critic Hank Stuever wrote. Josh Duggar molested five girls when he was a teenager, more than a decade ago, Michelle and Jim Bob confirmed in the interview with Kelly. Four of the five victims were his sisters, his parents said Wednesday. The parents took disciplinary action and arranged counseling for Josh. Whether they did enough, and soon enough, is now the subject of a spirited public debate that the family never wanted to have. The incidents of molestation were a well-kept family secret until two weeks ago, when In Touch Weekly published police records obtained through a freedom of information act request. Juvenile records are usually sealed, and the parents called the release of the records "illegal." Jim Bob said the family feels targeted by the local police chief, and is considering legal action. The Fox interview appeared intended, at least in part, to draw attention to the circumstances of the juvenile records release, and away from the sexual abuse. The parents talked about how some of the girls were touched "over their clothes." Some were also touched "under their clothes." In some cases, they were asleep; other times, they were awake. The girls "didn't really understand" what happened, Jim Bob said at one point. Critics of the family's handling of the scandal said after the interview that the parents seemed to be minimizing the seriousness of the abuse. They noted, among other things, that one of the victims was a young child. "What was just sad to me... was how willfully ignorant the Duggar parents are about child sexual abuse," attorney Lisa Bloom said on "CNN Tonight." "They don't seem to have educated themselves then or now about the facts." 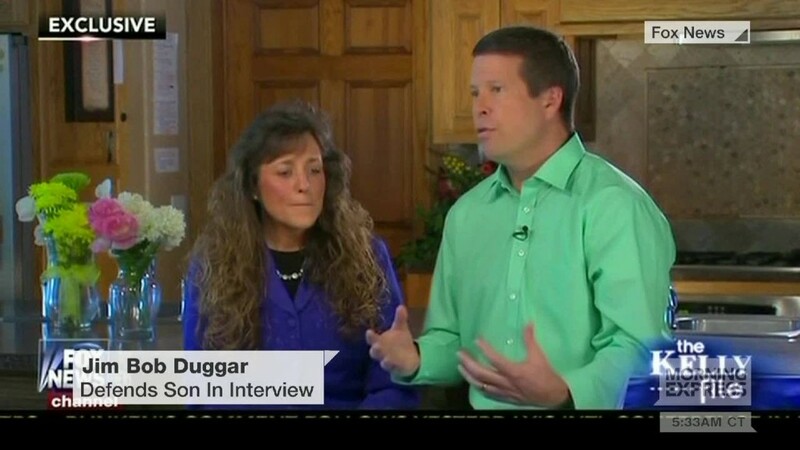 TLC isn't saying anything about the interview, which was arranged by the Duggars' personal public relations advisers, not the cable channel. And the channel is not planning on saying anything about the future of "19 Kids" anytime soon. While there are widespread doubts that TLC will resume production of the show, a spin-off is a possibility. People magazine reported last month that a spin-off series could "shift focus away from the large brood headed up by Jim Bob and Michelle Duggar, and instead focus on newlyweds Jill and Derick Dillard, and Jessa and Ben Seewald." No comment about that was included in Wednesday's television interview. But Jim Bob Duggar did remark to Kelly, "We'll be fine whether they film us or not."